The Oaklake II in Bridgwater Trails is a stunning move-in-ready home. This 1,533 sq. 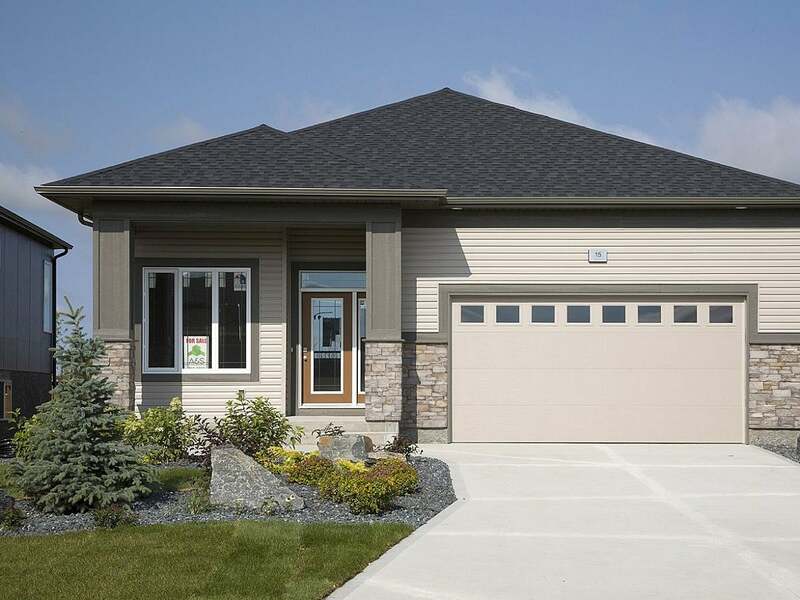 ft. bungalow is custom-built by A&S Homes. Standard features include driveway, approach, poured in place front steps, gas fireplace, MS Delta basement wrap, exterior Green Guard, and much more. This price includes piles, City of Winnipeg Impact Fee, a visitable lot with a developer fence and gate that backs onto a beautiful walkway. On the main floor of this home, you’ll find 9’ ceilings, an upgraded fireplace entertainment unit, maple mill work with maple Yorkshire/Shaker cabinets, 40.5″ upper kitchen cabinets, quartz kitchen countertops, and pot lights in the kitchen and great room. This home also features an upgraded flooring package with lots of laminates. The exterior is finished with a beautiful mix of stucco, wood trim package, and stone veneer. Visit The Oaklake II Quick Possession!